The city of Winchester, Virginia, and the surrounding area were the site of numerous fights during the American Civil War as both contending armies strove to control that portion of the Shenandoah Valley. 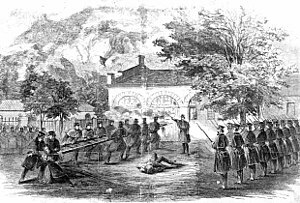 Ties between Winchester and the American Civil War are considered to begin with the involvement of the city in the suppression of John Brown's Raid in 1859. Colonel Lewis Tilghman Moore of the 31st Virginia Militia of Frederick County assembled 150 militia men from the Marion Guards, the Morgan Continentals, and the Mount Vernon Riflemen in October, 1859 and moved them by the Winchester and Potomac Railroad to Harper's Ferry. Ironically, the first death of Brown's raid was Heyward Shepherd, a free black from Winchester, who was buried in Winchester with full military honors. Following the raid, Judge Richard Parker of Winchester presided over the trial of John Brown, sentencing the insurrectionist to hang. One of the sons of John Brown and two other raiders (John Anthony Copeland and Shields Green) were later examined at the Winchester Medical College in Winchester as cadavers for medical training, an action for which the Federals later burned the college to the ground. On December 14, Robert Young Conrad, subsequently the Unionists' leader at the Richmond secession convention, composed resolutions adopted by a Frederick County meeting in Winchester. Although Northerners had launched an "insane war"against southern institutions, Frederick citizens regarded slavery "as perfectly consistent with civilization, humanity, and piety." Virginians would not "tamely submit" to any limitations of their rights. The resolutions appealed to the North to repeal obnoxious laws regarding fugitive slaves and to suppress abolitionists' activities that led "to invasions of other States, seducing slaves to abscond, harboring runaways, and otherwise disturbing the peace of sister States." At the same time, the resolutions renounced secession, promised "unfaltering attachment" to the Union, proposed boycotting imports from some northern states, and called for, if necessary, a national convention to resolve the sectional issues. Two thirds of the votes went to the two pro-union candidates, revealing the strong union sentiments of the town and county at that time. On April 4, the convention voted, and secession was defeated by a vote of 88 to 45. However, later that month the firing upon Fort Sumter prompted newly elected President Abraham Lincoln to issue a call for 75,000 volunteers, including a call to Virginia to provide troops. Governor Letcher responded on April 15 on behalf of the state refusing Lincoln's request. In response, the convention passed an ordinance of secession on April 17 by a vote of 88 to 55, which was ratified by popular vote on May 23, 1861. Immediately after this vote, Governor Letcher ordered the capture of the federal arsenal at Harper's Ferry, and Winchester companies of the Virginia militia were among the first to arrive, under the command of Colonel Thomas J. "Stonewall" Jackson. Winchester was a base of operations for several Confederate incursions into the Northern United States, at times threatening the Federal capital city. Winchester also served as a central point for troops conducting raids against the Baltimore and Ohio Railroad, Chesapeake and Ohio Canal, and turnpike and telegraph paths along those routes and the Potomac River Valley. For instance, in 1861, Col. Thomas J. Jackson removed 56 locomotives and 386 railroad cars, along with miles of track, from the B&O Railroad and ultimately closed down the B&O's main line for ten months. Much of the effort to transport this equipment by horse and carriage centered in Winchester. Winchester was a key strategic position for the Confederate States Army during the war. It was an important operational objective in Gen. Joseph E. Johnston's and Jackson's defense of the Shenandoah Valley in 1861, Stonewall Jackson's Valley Campaign of 1862, the Gettysburg Campaign of 1863, and the Valley Campaigns of 1864. During the Federal occupation of Winchester, many residents were exiled from town, personal property was stolen, citizens rendering medical assistance to wounded soldiers were shot and murdered, homes were illegally stolen, occupied and destroyed, a medical school was burned down, and the citizens of the Commonwealth were not allowed to vote on re-admittance to the Union under the reign of Major General Schofield. In this city (Winchester) of about 6,000 inhabitants ... my will is absolute law – none dare contradict or dispute my slightest word or wish. The secesh here have heard many terrible stories about me before I came and supposed me to be a perfect Nero for cruelty and blood, and many of them both male and female tremble when they come into my presence to ask for small privileges, but the favors I grant them are slight and few for I confess I feel a strong disposition to play the tyrant among these traitors. Hell is not full enough, there must be more of these Secession women of Winchester to fill it up. Most notably, Milroy was feared for his rash desire to execute Virginians, and his reputation for this from previous Alleghany campaigning precede him, striking great trepidation in the town, as Milroy set up his tribunals, without constitutional authority, and sentenced townsfolk to execution by firing squad. Many of the local blacks freed in January 1863 under the Emancipation Proclamation fled the area, presumably fearing reconquest by the Confederates (as in fact happened later in the year). Major General Philip Sheridan aggressively marched up the Valley from Winchester and destroyed "2,000 barns filled with grain and implements, not to mention other outbuildings, 70 mills filled with wheat and flour" and "numerous head of livestock," according to the Official Records. At the end of 1864, Maj. Gen. Sheridan stated that "The crow that flies over the Valley of Virginia must henceforth carry his rations with him". In spite of Winchester's wartime hardships, a few residents made great contributions to the Confederate cause, such as Dr. Hunter McGuire, Chief Surgeon of the Second Corps of the Army of Northern Virginia, who laid foundations for the future Geneva conventions regarding the treatment of medical doctors during warfare. Winchester served as a major center for Confederate medical operations, particularly after the Battle of Sharpsburg in 1862 and the Battle of Gettysburg in 1863, and set the stage for advancements in the practice of medicine, internationally and during combat operations. Portia Baldwin Baker – As the Union Army destroyed the Winchester Academy and a Quaker Church, Portia remarked, "They are foot by foot and plank by plank destroying our property". Julia Chase – Born in Maine in 1831, she moved to Winchester when her father became the U.S. Postmaster, and her home was on Loudoun Street & Fairfax Lane. Julia was a Unionist, and witnessed the mistreatment of Winchester loyalists by Confederate authorities, including the arrest of her elderly father. After three years of witnessing Union defeats and disappointments, she celebrated the "glorious" victory of Sheridan's army at the Third Battle of Winchester in 1864. Laura Lee – Laura was the daughter of Daniel Lee, who served in the Virginia House of Delegates and as the Frederick County Clerk. Laura was Pro-Secession, and resided in the home of her sister-in-law, Mary Greenhow Lee. Mary Greenhow Lee – Born to a wealthy family in Richmond in 1819, her father, Robert Greenhow was the Mayor of Richmond, Virginia. She married Laura's brother, Hugh Holmes Lee in 1843, who was a lawyer in Winchester. A pro-Secessionist, Mary was "banished" from Winchester on February 23, 1865 by Maj. Gen. Sheridan, and she never returned, living in Richmond and then Baltimore, Maryland. Cornelia Peake McDonald – Cornelia was married to a Winchester lawyer, Angus McDonald III, 23 years her senior, and who served as a Colonel in the Confederate Army. Cornelia is noted for tenderly caretaking for one of her slaves who had run away to the North, only to willingly return after mistreatment with the Union Army. Her home was ultimately used as a hospital. Kate Sperry – Born in 1843 in Winchester, Kate married Dr. Enoch Hunt who was a regimental surgeon in the 2nd Mississippi Regiment of the Confederate Army. Kate was a Pro-Secessionist, and is famous for her vow, "Surrender? Never Surrender". Among those who took part in battles at Winchester were future U.S. presidents William McKinley and Rutherford B. Hayes, who both were officers in the U. S. Army of West Virginia. MajGen. Milroy's defensive fortifications in Winchester, Virginia in June, 1863. Winchester was heavily fortified by forts and lunettes circumferencing the town, as well as along the outlying turnpike routes entering town . Within Winchester Milroy constructed or improved upon a total of ten defensive fortifications numbered Battery No. 1 through Battery No. 10, making improvements on many pre-existing forts and fortifications left by prior Confederate and Federal occupations. The fortifications were linked in places with roads and trenches. Fort Collier: Built by Confederate Lieutenant Collier and Virginia militia with the aid of Federal prisoners, this redoubt guarded the north entrance of town on the east side of the Martinsburg Pike. During later Federal occupations, it was known as Battery No. 10. The fort was constructed on low ground and was dependent upon artillery support from other forts in the area to be effective. It served as a fortified position blocking Union forces advancing up the pike. At the Third Battle of Winchester, Sheridan's cavalry flanked this position and overran this fort capturing two artillery pieces from Chapman's Virginia Battery . Fort Jackson: Originally built by Confederate troops and called the "fortification on the heights" or the "Main Fort", this was improved under MajGen. Banks and called "Fort Garibaldi" by the 39th New York regiment. The redoubt was improved extensively by Milroy's troops as Battery No. 2 and held 14 guns, including heavy artillery, and renamed Fort Milroy. Its current name was given after the Confederate victory in the Second Battle of Winchester. Fort Alabama: This was a large star-shaped lunette built by Federal troops in 1862, improved by Milroy as Battery No. 3 (Star Fort), and equipped with 8 guns and outlying rifle trenches. Its current name was given after the Confederate victory in the Second Battle of Winchester. Louisiana Heights: This was a 3 gun lunette and redans located due west of Fort Jackson which was occupied by Milroy as Battery No. 5 (called West Fort). It included a line of rifle trenches. Its current name was given after the assault by Confederate Louisiana troops in the Second Battle of Winchester. Carysbrooke Redoubt: A redoubt on high ground anchoring the east end of approximately two miles of earthworks which guarded the south side of Camp Russell (Union). The earthworks straddled the Valley Pike south of Winchester (south of modern VA 37 termination into Interstate 81), and Carysbrooke Redoubt was located east of the pike. Parkins Mill Battery: A lunette with small fort 4 miles south of Winchester at the Opequon river crossing on Front Royal turnpike (modern VA 522). Bower's Hill: A linear entrenchment along Bower's Hill south of Fort Jackson. MajGen. Banks attempted and failed to hold this defensively in the First Battle of Winchester, and from this hill, MajGen. Jubal Early and LtGen. Ewell surveyed their flanking maneuvers in the Second Battle of Winchester, as well as bombarded MajGen. Milroy's troops. Battery No. 1: A 6 gun lunette with infantry flanks on the south end of Fort Jackson (Fort Milroy), co-located on the same ridge line. Battery No. 4: A large star 6 gun lunette with rifle entrenchments and minor lunettes, located due north of Fort Alabama (Star Fort) along the same ridge line (north of modern VA 37). The rifle entrenchments between Battery No. 4 and Fort Alabama have been destroyed by the overlaying construction of VA 37. Battery No. 6: A small lunette with 3 guns and rifle trenches on a hill peak located in between Louisiana Heights (West Fort) and Battery 7 (located on the southeast corner of VA 37 and VA 522). Battery No. 7: A large 8 gun lunette and redans with trench lines on Apple Pie Ridge west of Apple Pie Ridge Road (on modern James Wood High School grounds). Battery No. 8: A grouping of a lunette and redans with infantry works west of Fort Alabama (Battery 3) and east of Battery No. 7. Camp Hill: A Confederal and Federal camp located in the modern Overlook Park on the south side of Winchester east of South Loudoun Street. Smithfield Trench Line: This was a mile-long Confederate trench line with ramparts built in a 90-degree angle northwest of Winchester and south of Fort Collier, used during the Third Battle of Winchester. Camp Russell: Camp Russell was a two mile long encampment with earthworks and trenches straddling the Valley Pike south of Winchester, just south of the intersection of modern VA 37 and Interstate 81. Carysbrooke Redoubt formed a part of this encampment. Camp Sheridan: Camp Sheridan and two accompanying small forts were located southwest of Winchester (centered on the intersection of modern Middle Road and Apple Valley Road). One fort was located west of the Middle Road and Apple Valley Road intersection, and the second fort was located just north of modern Firelock Court on Middle Road. CSA Camp: A Confederate encampment was located north of the Northwest Turnpike along modern Spinning Wheel Lane. Federal Camp: A Federal encampment was located north of the Northwest Turnpike along modern Echo Lane. Sheridan Field Hospital: This was a field hospital used by MajGen. Sheridan on the southeast corner of town on Opequon Avenue near Hollingsworth Drive. It was the largest field hospital operated by the Federals in the Civil War. White Sulphur Resort: also known as Jordan Springs, was a hotel and resort facility built by the property owner Branch Jordan in 1843 and 1855. Hotel operations ceased during the war while it was used by both sides as a hospital. The buildings remain to this day on Jordan Springs Road in Stephenson, Virginia just north of Winchester. Old Court House: The Old Court House in downtown Winchester was used as both a temporary prison and field hospital by both sides during the war. Stonewall Jackson's Headquarters: This house which belonged to Colonel Moore of the Virginia Militia is preserved as the Stonewall Jackson Headquarters Museum today. Located at 415 North Braddock Street, it served as the winter headquarters for Stonewall Jackson during 1861 and 1862. General Philip H. Sheridan's Headquarters: Sheridan utilized the Logan family home as his headquarters during the latter part of the 1864 Shenandoah Valley campaign. Sheridan began his famous ride here to rally his troops to victory at Cedar Creek on October 19, 1864. The home is located at 135 N. Braddock St.
Today, Winchester provides a wealth of exploration and tourism for Civil War enthusiasts. Jubal Early Drive snakes around south of downtown Winchester, along the central location for many of the battles. The modern flag of the city of Winchester closely resembles the first congressionally proposed national flag of the Confederate States of America. Both flags were composed of a field of red, upon which a saltire (Saint Andrew's Cross) is laid, with a heraldic shield in the center of the flag. The primary differences in the flags are the addition of a center blue saltire, and an English "Norman" lion instead of a 13-pointed star on the shield in the Winchester flag. The Confederate congress failed to accept the flag proposal of the Joint Committee on Flag and Seal in April 1862, and went on to adopt the "Stars and Bars" flag. The town's residents, initially reluctant to leave the Union, were caught up in the emotional uproar of the secession crisis. Ultimately they supported Virginia's decision and the Southern cause. A number of factors underlay that resolve. Slavery defined those factors. Fear of abolitionism provided a common denominator for the town's white citizens. ^ quoted in Delauter, p.49. Duncan, Richard R. Beleaguered Winchester: A Virginia Community at War, 1861–1865. (2007) ISBN 978-0-8071-3217-3. Holsworth, Jerry W., Dueling Diarists in Winchester. Civil War Times, June 2006, pp. 16–23. Kinney, Bentley, The Devil Diarists of Winchester. Link, William A. Roots of Secession: Slavery and Politics in Antebellum Virginia. (2003) ISBN 0-8078-2771-1. Phipps, Shelia, R. Genteel Rebel: The Life of Mary Greenhow Lee. Baton Rouge, Louisiana State University Press, 2004. Beach, William H. The First New York (Lincoln) Cavalry: From April 19, 1861 to July 7, 1865 . New York: The Lincoln Cavalry Association, 1902. Early, Lt.Gen. Jubal A. Autobiographical Sketch and Narrative of the War Between the States. With Notes by R.H. Early . Philadelphia: J.P. Lippincott Company, 1912.